When we last encountered Chef Makoto Okuwa, he was serving up a 23-course dinner at his Manhattan Beach hot spot, Sashi. Since then, the former Masaharu Morimoto protégé made an appearance on Iron Chef America, losing, unfortunately, to Michael Symon. After showing up at Michael Voltaggio's final dinner at The Dining Room, Okuwa's latest move landed him squarely at BreadBar, where he was able to try his hand at Hatchi, the restaurant's monthly guest chef series. For the uninitiated, Hatchi is a sequence of one-night-only dinners at BreadBar in which a special guest chef prepares an octet of dishes, priced at a reasonable $8 each. 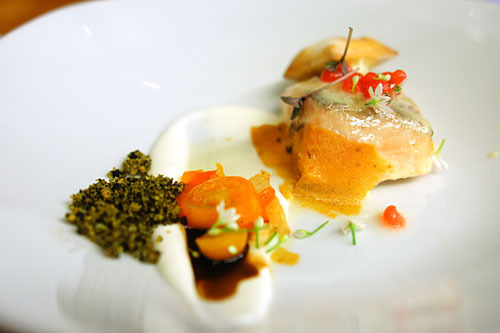 Past participants have included (in order of appearance): Debbie Lee (Jun '09), Michael Voltaggio (Jul '09), Roberto Cortez (Aug '09), Remi Lauvand (Sep '09), Eda Vesterman (Oct '09), Waylynn Lucas (Nov '09), Marcel Vigneron (Dec '09), Ricardo Zarate (Jan '10), Iso Rabins (Feb '10), Kumiko Yagi/Ramon Perez (Mar '10), Saul Cooperstein (Apr '10), Brian Redzikowski (May '10), and Walter Manzke (Jun '10). Next Month, Chicks with Knives will serve up "Love & Kisses & BBQ," while September brings us "Girando Le Isole: A Menu Inspired by the Islands of Sicily and Sardinia," courtesy of Pizzeria Ortica alums Steve Samson and Zach Pollack. Foodie types in attendance tonight included Alexandra B. and Amy K. from Yelp, Christie of Pardon My Crumbs, Darin of Darin Dines, Holly of The Michelin Project, Ila of I Nom Things, Linden of The Gastronomnom, and Mike of Right Way to Eat. 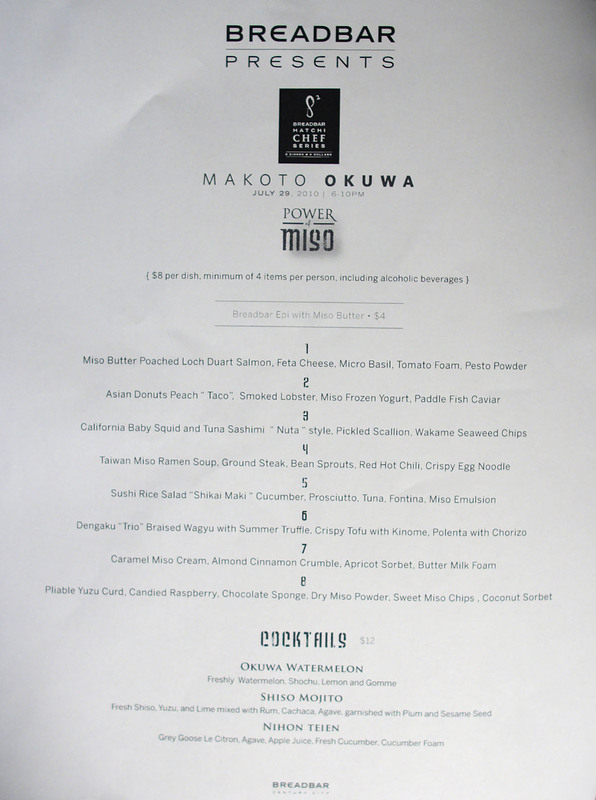 Above, we see Chef Okuwa's menu, entitled "Power of Miso," an ode to the ubiquitous Japanese ingredient. Click for a larger version. 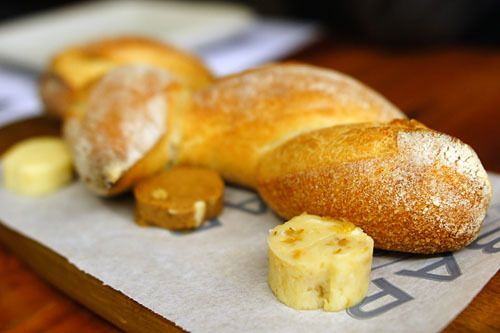 Breadbar's standard baguette arrived with three types of miso-infused butter. First was the white shiromiso, the mildest of the trio, showing off a pleasant sweetness on top of your typical buttery goodness. The red akamiso, on the other hand, was much heavier in savor, with a dark, umami-tinged essence. The barley-based mugi miso, finally, was somewhere in the middle, showing off a marked saltiness at first, while transitioning to a rather sugary finish. Okuwa had crafted three cocktails to pair with our meal, the first of which was his eponymous Okuwa Watermelon, made with shochu, lemon, gomme (sort of a gum arabic emulsified simple syrup), and, of course, watermelon. This chuhai-esque libation demonstrated juicy, delicious watermelon flavors initially, while the back end hinted at the slight nuttiness of the shochu. I appreciated how the cocktail was sweet, but not cloyingly so--a perfect drink for summer quaffing. Our first course of salmon came to us from Scotland's Loch Duart, one of the leading purveyors of sustainably farmed salmon in the world. I found the fish tremendously tender, succulent, and just beautifully cooked. The use of miso gave the salmon a subtly sweet attack, which deftly countered the slight brininess on the finish--superb. Meanwhile, the feta, basil, tomato, and pesto lent a somewhat Mediterranean cast to the dish, though the feta was a bit too domineering at times. Finally, I absolutely adored the textural contrast imparted by the air bread. 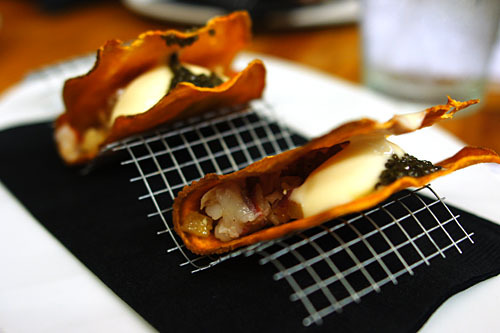 Wrapped in yam potato shells, these were perhaps the most unconventional "tacos" that I've ever had. The smoky savor of the lobster was quite apparent at first, but this then led to the somewhat overbearing sweetness of peach and white miso, while the finish was dominated by the lingering brine of caviar. Unfortunately, given the rapidly crumbling shell and melting yogurt, the dish was difficult to eat, leading to uneven, unbalanced bites that didn't let the flavors meld as they should. Next up was one of my favorite courses of the meal. The squid came cooked to a wondrously supple consistency, and was stuffed with a lovely blue crab salad that deftly complemented the cephalopod's natural sweetness. 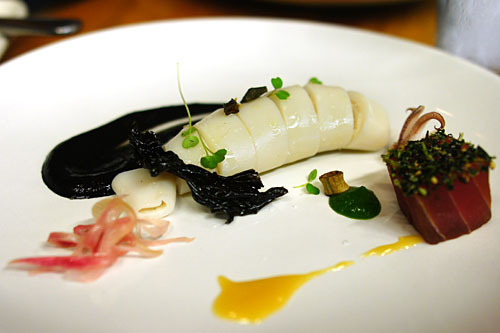 At the same time, the pickled scallion and green onion purée, augmented by the application of sweetish vinegar sumiso and briny squid ink miso, provided sharp pricks of piquant power that served as superb counterpoints to the relative mildness of the squid--excellent. The tuna, meanwhile, was certainly up to par, tinged with a nice wasabi burn; but given the strength of the squid, it was overshadowed. Given the similarity between shiso and mint, using the leaf in place of, or in addition to mint is a no brainer. 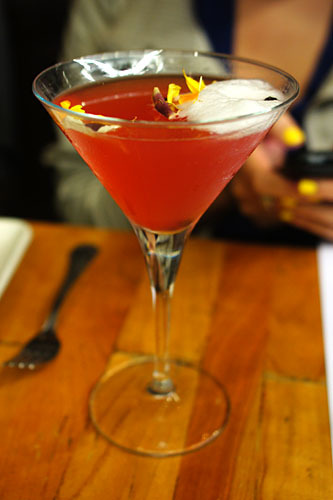 In fact, I'd had a similar drink three years ago in Denver at Zengo. 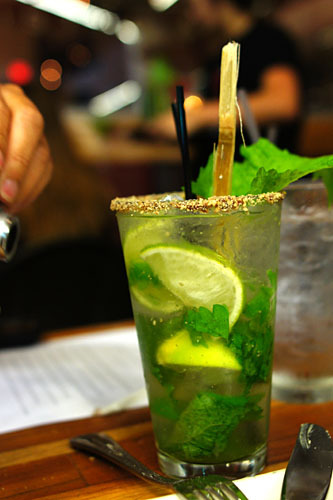 In any case, the Shiso Mojito (shisojito? shishito?) 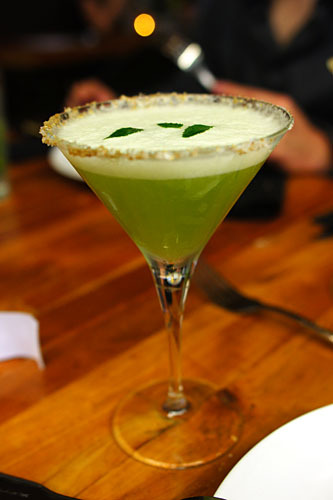 here was composed of shiso, lime, rum, cachaça, agave, plum, and sesame seed (on the rim). The result was quite delicious, actually, with the sesame-umeboshi adding a fascinating nutty-sour finish to the combination of minty-tart flavors and earthy booze. I did find it fascinating that Okuwa added cachaça, making the drink somewhat of a mojito-caipirinha hybrid. 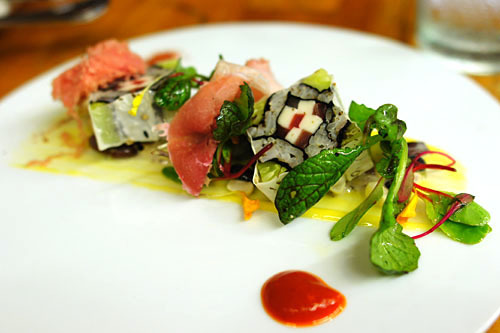 During his tenure at Morimoto, Okuwa was known for his signature shikai maki, an elaborate square-shaped roll featuring tuna and prosciutto. At Breadbar, he presented a version with tuna, fontina cheese, and cucumber, all encased in a soy paper wrap. Taking a bite of the maki alone, I noted mild flavors of tuna, interspersed with a bit of gravity from the cheese, all leading to a cool, cucumber- and nori-tinged finish. Very enjoyable. The accompaniments, however, really took this dish to the next level. I appreciated the additional savoriness courtesy of the miso and ham, but what was even more appealing was the homemade Sriracha, which lent a fantastic heat to things. Also quite delectable was the mélange of beans and chickpeas in the dish, both of which added substantial weight and earthiness. At Sashi, I had Okuwa's signature Taiwan ramen noodle soup and loved it. I was expecting something similar here, but boy was I wrong--this "soup & sandwich" course was almost like a deconstructed version of the former dish! I first attacked the heady stew, and immensely relished its profound, spicy smack, imbued with the earthiness of wood ear mushroom and the zest of lemon verbena and mayu (a sauce of charred garlic). As good as the soup was, the "slider" was arguably better. 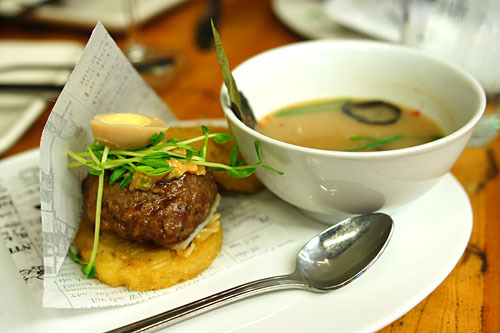 Described by my dining companions as a fancy MOS Burger, the burger showed off fantastic hearty, peppery, and beefy flavors, beautifully balanced by the paired bean sprouts, the slice of naruto fish cake, tamago, and egg noodle "buns." A table favorite. My final cocktail of the evening was the Nihon Teien, comprised of Grey Goose Le Citron, agave, apple juice, cucumber, and cucumber foam. The name means "Japanese garden," and given that nomenclature, I would've appreciated some more herbaceous notes on this one. Nevertheless, I did enjoy the cocktail, with its unabashed cucumber-y bouquet, strong flavors of apple, mild alcoholic burn, and salty finish. Our final savory of the night came in the form of dengaku, a style of grilling in which foods are coated in sweet miso and cooked. I started with the wagyu. Cooked so tender as to barely require chewing, it tasted deep, dark, and positively bovine (though not particularly truffle-y); one had to be careful, however, not to overwhelm the meat with the heavy savor of the accompanying Nagoya miso. Next up was the tofu, which had that great textural interplay of crisp exterior-fluffy interior that I crave. Its subtle sapor played nicely with its concomitants of sesame and kinome (Szechuan peppercorn leaves, used to make sansho). Finally, I devoured the polenta, the delicate flavor of which was marvelously countervailed by the piquant pinch of chorizo. My last experience with a miso-based dessert at Providence left me a bit disconcerted, but fortunately, Okuwa's were a bit more approachable. The cream put forth prodigious notes of caramelized sugar initially, but this then led to a strong, savory miso finish with a touch of cinnamon; it was actually a bit overwhelming. 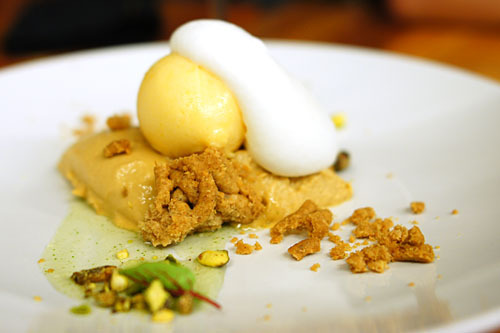 Thankfully, the dessert was made whole by the application of the apricot sorbet, buttermilk, and pistachio, all of which beautifully tempered the caramel cream, finishing the dish. 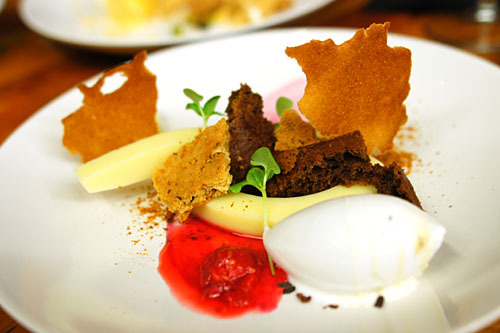 We ended the evening with an almost Voltaggio-esque dessert. The curd, taken alone, had a pure, almost bracingly sour yuzu flavor that played surprisingly well with the gentle sugariness of the chocolate and saltiness of the miso. Simultaneously, the raspberry provided overarching notes of berry sweetness, while the close, again, was imbued with the essence of miso. Okuwa's homage to fermented soybean was a risky move, given miso's ability to be rather off-putting, but he pulled it off admirably. 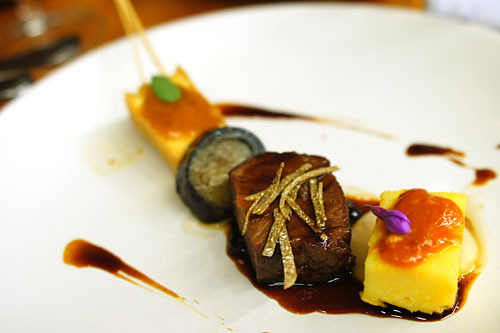 The Chef was really able to highlight the various faces and facets of miso, and how the ingredient can be incorporated into cuisine in so many drastically different ways. Standout dishes included the ramen soup, squid, and sushi rice salad. Given that I've had Okuwa's food at Sashi, I can say that what he presented tonight was considerably different--more complex, more creative, more challenging--more my style. i was tempted to attend this but wasn't sure if i could handle 8 plates of miso. Glad you enjoyed! Dishes look innovative and cocktails look fun. Kevin- You are SLACKING on your Lucques post. jk, this one looks good! Stephanie: That was my concern as well. You going to next month's Hatchi? This look really good! Too bad I couldn't make it to the event. I definitely missed out! GJ on the posting though. Sorta felt like I was there. Sam, are you planning on making it out to future Hatchi events? Yea. I'm planning on making them. I just need to get the news faster for future hatchi events. Sam, the next one with Chicks with Knives is on 8/26, and the one after that is on 9/30, with Steve Samson (of Pizzeria Ortica). Crap! I just saw your respond on this. I don't think I make it out to the August one. But I'm definitely interested in the Steve Samson event in September. Sam, I was planning on going to the August one, but unfortunately it looks like I'll be out of town on business that day. It sound silly, but I missed good old Hatchi at BreadBar already. I know the Test Kitchen caught fire right after this series, but I always hoped they bring it back at either one of the BreadBar or even the pop up with the Twist series. Mike, I agree. I'd like to see Hatchi resurrected as well. The idea just never took off for some reason.